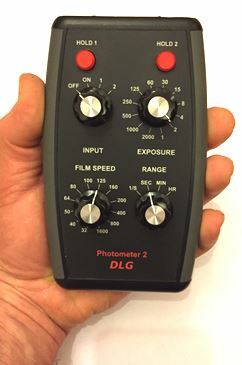 The Photometer 2 was developed in consultation with a group of large format photographers, who wanted an affordable solution to image-plane point metering. 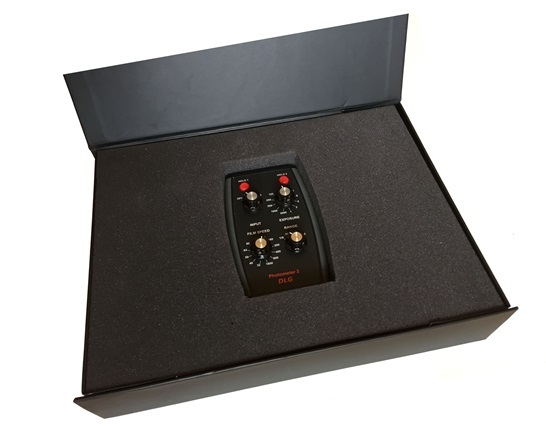 Although image plane metering systems of this type have long been available, the hefty price tag (admittedly providing extensive and sophisticated features) has made the cost prohibitive for amateur and cost-concious professionals. The solution was to develop a less sophisticated and less feature-heavy metering system that provided the essential basic functions in an affordable yet accurate and reliable unit. 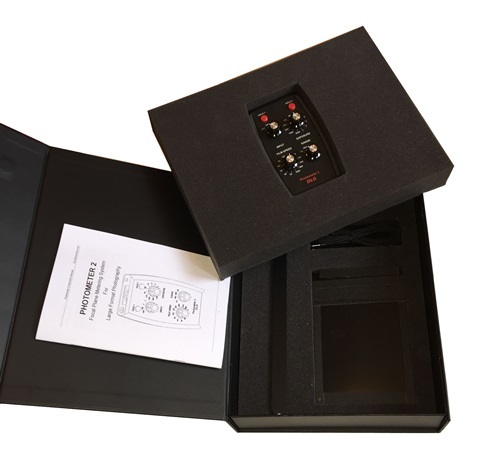 The result is a convenient hand-held metering unit, with a metering probe in a frame that inserts in the camera in place of the usual film carrier. Ideal when using the Zone system. Case - black ABS plastic, frame black ABS plastic, meter probe fibreglass. The frame, with its metering probe, is inserted into the rear of the camera in place of the usual film carrier. The metering probe is connected to the meter unit with the connecting cable provided. The metering probe can be observed through the ground glass and positioned to a point of interest in the image. 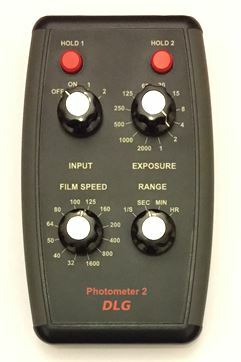 The "exposure" control on the meter is adjusted to zero the metering display. This tells you the exposure required to give a mid tone at the metered point in the image. A range of positions in the image can be selected and metered in order to determine the best compromise exposure for the image as a whole, and to ensure that chosen image highlights and shadow tones are rendered correctly. This method allows the user to optimise the exposure to suit any particular region of interest in the image, for example, to allow good rendering of shadow or highlight detail. 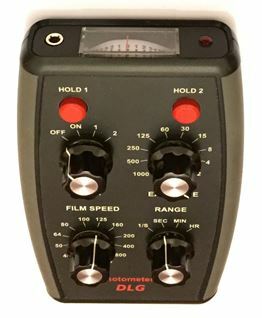 The meter display is calibrated in stops and covers a range of plus/minus 4 stops (a factor of +/- 16 in brightness) - this encompasses the normal usable range of the film and indications at the end of this range will normally result in full white or full black in the final print. Two memories are provided which allow the light intensity at two points in the image to be retained for future reference when metering a third. 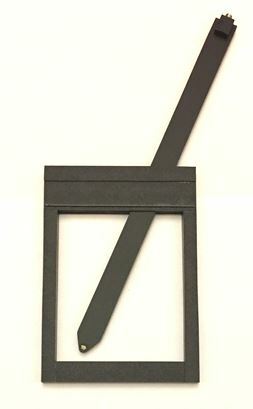 A rear sliding shutter is provided which may be closed when excessive light is entering through the ground glass and affecting the readings. ¼ hour to ⅓ stop minimum. Frame: - to suit camera format. The unit can be supplied with frames to suit cameras of 4x5, 5x7 or 8x10 format. Please ensure you specify the correct size when ordering. Additional frames can also be purchased if you to allow the meter to be used with multiple formats. We can also supply other sizes to order including bespoke sizing. Please contact us. It is possible to have your meter customised, for example, to include different film speeds, exposure ranges etc. Please contact us and w e will be happy to discuss your requirements and provide a bespoke solution. Please contact us if you require any further information prior to purchase. All provided in a foam lined quality rigid storage carton. Please note that due to shipping rules the unit is provided without battery - type PP3 required.